The aim of this study was to determine if a 457 nm blue laser could effectively polymerize dental composite resins. After light curing 6 dental composite resins using a laser or a LED light-curing unit at 530 mW/cm2 and 900 mW/cm2, respectively, degree of conversion and microhardness were evaluated. 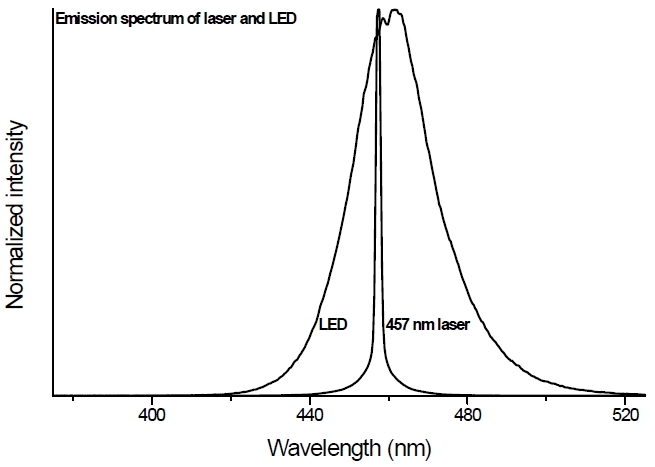 Degree of conversion of specimens by the laser and LED was similar (on top surface 54.4-67.7% and 55.2-67.1%, respectively; on bottom surface 35.1-53.8% and 45.4-53.1%, respectively). Microhardness was also similar (on top surface 28.5-83.6 Hv and 19.1-82.4 Hv, respectively; on bottom surface 22.5-65.4 Hv and 16.8-74.4 Hv, respectively), although, in some cases, laser-treated specimens showed slightly lower microhardness than the LED-treated on bottom surface. The present study shows that the 457 nm laser can polymerize dental composite resins to the same level as LED achieved. 본 연구는 457 nm의 빛이 복합레진의 중합에 미치는 영향을 평가한 것이다. 이를 위하여 파장이 457 nm인 레이저와 LED를 광원으로 그리고 6종의 복합레진을 시료로 선택하였다. 광 세기는 레이저와 LED 광조사기가 각각 530 mW/cm2과 900 mW/cm2 이었고 광 조사된 시료의 미세경도와 중합도를 평가하였다. 그 결과 시료의 중합도는 두 광원에 대해서 비슷하였다 (윗면에서 각각 54.4-67.7%와 55.2-67.1% 이었고, 바닥면에서 각각 35.1-53.8%와 45.4-53.1% 이었다). 미세경도는 기본적으로 두 광원에서 비슷하였다 (윗면에서 각각 28.5-83.6 Hv와 19.1-82.4 Hv 이었고, 바닥면에서 각각 22.5-65.4 Hv와 16.8-74.4 Hv 이었다). 그러나 어떤 시료는 바닥면에서 레이저로 광조사된 경우가 LED로 광조사된 경우보다 약간 낮은 미세경도값 (28.5-65.4 Hv vs 47.2-74.4 Hv)을 보였다. 본 결과는 457 nm의 빛이 복합레진을 LED의 경우와 비슷한 수준으로 광중합 할 수 있음을 시사한다. The use of light-curing dimethacrylate-based dental composite resins is popular and has become routine for the restoration of damaged or decayed teeth, because of their excellent aesthetic qualities and because their mechanical properties are compatible with host teeth [Ferracane, 2011]. In addition, these resins are user-friendly because of straightforward, rapid, controlled initiation of polymerization process. Two ingredients are essential for external light-composite resin interactions, that is, photons and the photoinitiator [Leprince et al., 2013; Cramer et al., 2011]. Photons supplied externally by a light-curing unit (LCU) initiate the polymerization process, whereas the photoinitiator, which is excited by photons to produce free radicals, is a constituent of the resin matrix. The free radicals so formed then convert monomers into a polymer network. Camphorquinone (CQ) is the photointiator used in all light-curing dental composite resins and has a light absorption band approximately at 380-510 nm. Since light is maximally absorbed through the complementary relation, blue light matches maximally with yellow CQ, which is why all LCUs emit blue light. Quartz-tungsten-halogen (QTH)-lamp based LCUs have the widest spectral distribution [Kumar et al., 2012; Mousavinasab and Meyersm, 2011; 조호성 등, 2010], and their emission band (at 370-520 nm) matches the absorption band of CQ. However, light-emitting diode (LED) LUCs have much narrower emission band (approximately 425-500 nm) [Poggio et al., 2012; Polydorou et al., 2011; 이응주 등, 2005], which is more focused on the absorption peak of CQ. On the other hand, the light emitted by lasers is highly narrow (monochromatic), coherent, and directional, and of the available lasers, the argon laser had been widely studied in dentistry in conjunction with dental composite resins due to its spectral match with CQ in the higher wavelength region of its absorption band (488 nm) [Mirsasaani et al., 2011; Tielemans et al., 2009; 박주석 등, 1995]. However, despite its excellent ability to polymerize dental composite resins, the argon laser has not been widely accepted as a LCU because of its cost. Under these circumstances, the diode-pumped solid state (DPSS) laser can provide an alternative. Initially, this type of laser was used as a light source for flow cytometers [Habbersett et al., 2007; Telford et al., 2005]. However, recent advancements in laser diode technology have resulted in the availability of high power DPSS and diode lasers of various wavelengths. The ability of a laser emitting at 473 nm has been examined for the curing of dental composite resins [Kwon et al., 2008; Park et al., 2010; Yun et al., 2012]. According to these studies, this DPSS laser is able to polymerize various dental composite resins to the levels achieved by other LCUs, such as, QTH and LED LCUs. This encourages the consideration that a diode laser of 457 nm, which lies in the absorption band of CQ, might be useful for the polymerization of dental dental composite resins. Due to the recent appearance, the test of this laser in dentistry is limited [권 등, 2017; 박, 2017]. Accordingly, the aim of this study was to evaluate the degree of polymerization of dental composite resins using the 457 nm diode laser as a light source. Through the study, microhardness and degree of conversion (DC) were examined and compared. For the study six different dental composite resins with A3 shade [two nanocomposite resins: Premise Packable (PR) and Filtek Z350XT (ZX); two microhybrid resins: Aelite LS Posterior (AL) and Tetric EvoCeram (TE); two flowable resins: Tetric N Flow (TF) and Esthet X Flow] were used. Their details are listed in Table 1. For light curing, a LED (L.E.Demetron, Kerr, Danbury, CT, USA) and a diode laser (LVI Technology, Seoul, Korea) of 457 nm were used (Figure 1). The output light intensity of LED was 900 mW/cm2 according to its built-in radiometer, and the output power and spot size of the laser beam were approximately 150 mW (PM3/FIELDMAX, Coherent, Portland, OR, USA) and 6 mm, respectively. The resultant light intensity was approximately 530 mW/cm2. To measure the surface microhardness (Hv) of specimens, resin was filled into a metal mold (4×2×3 mm) and light cured for 40 s using LCU. The cured specimen was removed from the mold and aged for 24 hr in a 37℃ dry and dark chamber. The microhardness of top (z=0) and bottom (z=3 mm) surfaces was measured using a Vickers hardness tester (MVK-H1, Akashi, Tokyom Japan) (n=12 for each test condition) by measuring the size of microindentations which were made using a 200 gf load and 10 s dwell time conditions. Results were analyzed using one-way ANOVA with post-hoc Tukey test for multiple-comparisons. The student’s t-test was used to analyze LCU results. Statistical significance was accepted for p< 0.05. Table 2 shows the DC achieved by two LCUs. For the specimens, flowable resin EF had the highest DC regardless of the LCU used, and AL had the second highest. The DC achieved using two LCUs were not significantly different on top (54.4-65.9% for the laser; 55.2-67.1% for LED) and bottom surfaces (35.1-53.8% for the laser; 45.4-53.1% for LED). The microhardness of specimens is shown in Table 3. On top surface, microhardness by the laser and LED were 28.5-83.6 Hv and 19.1-82.4 Hv, respectively. On bottom surface, for the laser and LED treated specimens, microhardness were 22.5-65.4 Hv and 16.8-74.4 Hv, respectively. Difference between top and bottom surfaces was 18.0-65.9% and 8.3-42.7% for the laser and LED, respectively. The microhardness values of two LCUs were not significantly different on top and bottom surfaces (p>0.05). Lasers provide highly monochromatic, coherent, and directional light as compared with other light sources. Due to these exceptional features, lasers have been used in many fields as a light source. In dentistry, the 488 nm argon laser is used for the light curing of camphorquinone-based dental materials [Mirsasaani et al., 2011; Tielemans et al., 2009; 박주석 등, 1995], and is commonly used for the restoration of decayed or damaged teeth in conjunction with dental composite resins. However, an argon laser represents a substantial investment, and thus, other types of LCUs, such as, QTH and LED, are more popular in dental practices. DPSS lasers produce light by pumping a solid medium (crystal) with a powerful laser diode, and then doubles the frequency of the light produced. Initially, a 532 nm DPSS laser was used as a light source for flow cytometers [Habbersett et al., 2007]. Recently, the feasibility of a 473 nm laser was examined for the light curing of dental composite resins [Kwon et al., 2008; Park et al., 2010; Yun et al., 2012]. The advantages of the 473 nm DPSS laser as compared with the argon laser are its portability and lower price. Among the lasers, the 457 nm laser was only recently introduced and has not been previously examined in dentistry. Polymerization is a complex process that converts monomers to a polymer network via the activation of a photoinitiator (CQ) in the presence of an accelerator (a tertiary amine). The activation of CQ is initiated by the blue light from LCUs. However, since the bandwidth of LED and laser blue light is quite different, the resultant degree of polymerization can be influenced by the difference of emission bands. DC provides a means of quantifying monomer conversion to polymer [Rueggeberg et al., 1990]. In the present study, the DC values of the specimens produced by two LCUs at different light intensity (530 mW/cm2 vs 900 mW/cm2 for the 457 nm laser and LED, respectively) were similar (on top surface: 54.4-67.7% for the laser, 55.2-67.1% for LED; on bottom surface: 35.1-53.8% for the laser, 45.4-53.1% for LED), although AL had a much lower DC value on its bottom surface when cured using the laser. This achievement of a similar DC by the laser at a lower light intensity suggests that monochromatic light can more effectively achieve polymerization. In the present study, DC and microhardness were poorly correlated (R<0.26), showing that higher DC values do not automatically mean high microhardness [Lima et al., 2012; Calheiros et al., 2008; Bouschlicher et al., 2004]. Thus, since cross-link density, filler distribution, and condensation by shrinkage, are not fully reflected to the DC values, it can be less sensitive in estimating the degree of polymerization than by microhardness. 1. Dental composite resins cured using the 457 nm laser were found to be similar to the same resins cured with LED in terms of microhardness and DC. 2. Accordingly, it is believed that the 457 nm laser has substantial potential as a light source for the light-curing of dental composite resins. * 이 논문은 부산대학교 기본연구지원사업(2년)에 의하여 연구되었음. Bouschlicher, MR, Rueggeberg, FA, Wilson, BM, (2004), Correlation of bottom-to-top surface microhardness and conversion ratios for a variety of resin composite compositions, Oper Dent, 29, p698-704. Calheiros, FC, Daronch, M, Rueggeberg, FA, Braga, RR, (2008), Degree of conversion and mechanical properties of a BisGMA:TEGDMA composite as a function of the applied radiant exposure, J Biomed Mater Res B Appl Biomater, 84, p503-509. Habbersett, RC, Naivar, MA, Woods, TA, Goddard, GR, Graves, SW, (2007), Evaluation of a green laser pointer for flow cytometry, Cytometry A, 71, p809-817. Kumar, CV, Gururaj, M, Paul, J, (2012), A Comparative Evaluation of Curing Depth and Compressive Strength of Dental Composite Cured with Halogen Light Curing Unit and Blue Light Emitting Diode: An in vitro Study, J Contemp Dent Pract, 13, p834-837. Lima, AF, de Andrade, KM, da Cruz Alves, LE, Soares, GP, Marchi, GM, Aguiar, FH, Peris, AR, Mitsui, FH, (2012), Influence of light source and extended time of curing on microhardness and degree of conversion of different regions of a nanofilled composite resin, Eur J Dent, 6, p153-157. Mousavinasab, SM, Meyers, I, (2011), Comparison of Depth of Cure, Hardness and Heat Generation of LED and High Intensity QTH Light Sources, Eur J Dent, 5, p299-304. Peutzfeldt, A, Asmussen, E, (2004), Investigations on polymer structure of dental resinous materials, Trans Acad Dent Mater, 18, p81-104. Polydorou, O, König, A, Altenburger, MJ, Wolkewitz, M, Hellwig, E, Kümmerer, K, (2011), Release of monomers from four different composite materials after halogen and LED curing, Am J Dent, 24, p315-321. Telford, W, Murga, M, Hawley, T, Hawley, R, Packard, B, Komoriya, A, Haas, F, Hubert, C, (2005), DPSS yellowgreen 561-nm lasers for improved fluoro-chrome detection by flow cytometry, Cytometry A, 68, p36-44. 권용훈, 김승서, 설효정, (2017), 빛의 파장이 복합레진의 경도와 중합수축에 미치는 영향, 대한치과재료학회지, 44, p367-376. 박미경, (2017), 메탈브라켓 부착시 벌크필복합레진의 전단결합강도 평가, 대한치과재료학회지, 44, p95-105. 박주석, 장혜숙, 송진식, 최용석, 김경남, (1995), Ar 레이저를 이용한 치과용 광중합형 복합레진 중합의 효용성, 대한치과재료학회지, 22, p207-216. 이응주, 조병훈, 손호현, 엄정문, 임범순, 이인복, (2005), 반사재의 종류에 따른 광반사가 복합레진의 중합률 및 표면경도에 미치는 영향, 대한치과재료학회지, 32, p343-350. 조호성, 윤동인, 박미경, 김종화, 설효정, 김형일, 권용훈, (2010), 광조사 거리가 복합레진의 중합에 미치는 영향, 대한치과재료학회지, 37, p313-319. * Statistically significant difference for resin product is shown by superscript lettersa,b,... Same letters are not significantly different (p > 0.05). letter is not significantly different.